According to information reaching SEARCHLIGHT, on Sunday, September 6, 2009, a prison officer was delivering breakfast to Caine when he noticed that Caine was not moving. Caine was then rushed to the Milton Cato Memorial Hospital where he was pronounced dead. Caine, 48, of South Rivers and Dubois, had been on remand at Her Majestyâs Prison after he was charged with the murder of Aswald âCountryâ Lewis, a 42-year-old man of Peruvian Vale. 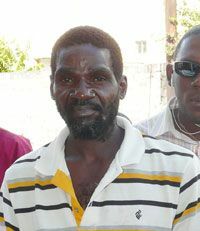 It is alleged that on March 24, 2009, Caine beheaded Lewis at Dubois before turning himself over to the Penniston Police. Caineâs sister Lydia Audain told SEARCHLIGHT that on Sunday, September 6, she received a message that a prison officer wanted to speak with her. Later that day, when she finally spoke with an official at the Prisons, Audain said she was told that her brother was not feeling well and that he was being taken to the hospital. âThey told me they do not know what might happen later and it is nothing to worry about, so I must come into town tomorrow,â Audain recalled. The South Rivers resident said when she visited Her Majestyâs Prison on Monday, September 7, she was informed that her brother had died at the hospital. âI am really surprised by all of this. It just does not make sense because I never knew my brother to have any sickness before. I just visited him last month,â the bereaved sister said. Audain said she is still baffled as to why a prison officer would tell her there was nothing to worry about. An autopsy carried out on Caine revealed that he died on September 6, 2009, from Pulmonary Thromboembolism, or a blockage of one of the arteries of the lung by a blood clot from the deep veins. Brother of the deceased Medford Caine said that when he went to the hospital on Monday, one of the doctors told him that Osborn arrived at the hospital dead. The following day, Medford said he was present for the autopsy and noticed two bruises on his brotherâs chest. âAfter I saw the bruises, the police dem who been there tell me to go outside and I find that kinda fishy,â Medford stated. The last time Medford said he visited Osborn was in August, when he carried some underwear for him. Medford said Osborn appeared to be fine. Caine also added that his brother never once complained of any sickness while in jail. âHow is it we only find out about his death on Monday and not the day before…the post mortem clearly say that he died on Sunday and they wait until the next day to say something. It just not right,â Caine said. Some of the family members who visited SEARCHLIGHT on Wednesday say they believe that officials at Her Majestyâs Prisons are withholding information surrounding their brotherâs death from them. They are also adamant that he didnât die at the hospital. When contacted, Superintendent of Prisons Eric Rodriguez said that he had not yet received a copy of the post mortem report and declined comment on the matter. Caine will be buried this Sunday at the Colonaire cemetery, after a funeral service which will take place at South Rivers.